"In Texas, falling behind on your student loan payments can cost you your license to work" was first published by The Texas Tribune, a nonprofit, nonpartisan media organization that informs Texans — and engages with them — about public policy, politics, government and statewide issues. When Roderick Scott Sr. submitted an application to renew his teacher’s license in the summer of 2015, he thought the matter was handled. He had no idea that, months later, a decades-old Texas law would nearly derail his career as a middle school teacher in north Dallas because he’d defaulted on his student loans. Over the course of three years, Scott said he swiftly lost a “dream job,” was evicted, had his bank account garnished and eventually filed for bankruptcy. He's not the only one who's suffered such dramatic repercussions. Texas is among several states that bars teachers, dentists, nurses and other professional license holders from renewing their licenses if they are in default on their student loans. For Scott, 43, the first sign of trouble came one day in the fall of 2015. The school’s head of human resources called Scott into an office and asked why he hadn’t renewed his teacher’s license – a certification most Texas educators must have. Scott said he was confused. He’d submitted an online application and paid the fee to renew his license weeks ago. It took one frantic phone call to discover there was a major problem. Scott's renewal hadn’t been processed because he had fallen behind on his loan payments, and he quickly realized he was about to lose his best chance of getting back on track: his job as a teacher. “I was like, ‘Oh my, you’re crazy,’” Scott said. A tool that "wouldn't really address the problem"
Texas is one of 19 states that will hold or revoke the work licenses of teachers and other professionals if the person is in default on their student loans, according to The New York Times. Members of the state commission that helped pass the law are deceased, could not be reached or did not remember details about its passage. But a legislative liaison who met with government staff about the law said he recalls thinking that it "wouldn’t really address the problem” of defaults in the for-profit sector. “It may be helpful, but the defaults you see out there are largely among those who went to private trade schools and who probably didn’t get certified in what they went to school to be,” said George Torres, then the governmental relations director for the Texas Guaranteed Student Loan Corporation, a public nonprofit that's since been privatized and renamed Trellis Company. Suspending licenses penalized a different group of students, he said – those who’d graduated, gotten a certification, and had a lower risk of not paying back their loans. Still, Torres said, it was a tool proposed by legislative staff — one that could be fine-tuned later, if needed. "The money is needed around the house"
The threat of losing his license — and therefore his job — pushed Scott, the Dallas middle school teacher, to take drastic action. He immediately paid the loan collector — borrowing money to do so — and entered into a repayment plan that let him keep his license. But during the time it took him to sort out the paperwork, his students were moved to a different teacher and he lost a department-chair position that came with an added stipend – making it even harder to make the loan payments, he said. Scott then made a string of financial sacrifices to afford the more than $300-a-month payment his loan collector asked for. He put the loan payment before rent and other bills. He was evicted, stayed with his brother and considered setting up a GoFundMe page to help ends meet. He tried to hide the trouble from his students, and from his 11-year-old and 3-year-old kids. Scott’s loans were issued by the Texas Higher Education Coordinating Board, which a division in Attorney General Ken Paxton's office is responsible for collecting on. Trellis, the privatized descendant of the Texas Guaranteed Student Loan Corporation, plays a similar role for a handful of federal loans. A spokesperson for Paxton’s office said they don’t draft policy and so couldn’t comment on how effective not renewing a license is at getting borrowers back on track with their loans. Trellis has never tried to check. But Jeff Webster, the director of research at Trellis, said the company only uses the license provision as a last resort. Trellis, which also provides financial and loan counseling, will first offer eligible borrowers options like a deferment or to switch to an income-driven plan — a repayment option for federal loans that lets a low-earning borrower make smaller payments over a longer period of time, Webster said. Scott, whose loans are not with Trellis, says he wasn’t given this option. Professional organizations contacted by the Tribune, including the Texas affiliate of the American Federation of Teachers, said they hadn’t heard of this situation befalling their members and thought it did not happen frequently. This may be because the 1989 legislators’ hypothesis was correct: Holding a professional license hostage is an effective way of getting a borrower’s attention. Data from the Texas Education Agency suggests that, like Scott, many educators whose licenses are denied for student loan default make payments and are able to have their renewal processed soon after. Critics of the practice, however, say it can also tee up an entirely new set of financial challenges for the borrower. “When teachers and nurses in Texas receive letters saying they'll lose their professional license unless they make a payment they can’t afford, too many of them wind up doing whatever it takes to stave off financial ruin,” said Randi Weingarten, president of the American Federation of Teachers. “It doesn’t actually get the loans paid off any faster, it just drives them deeper in the hole." Scott, for example, said he stopped paying rent in order to have his teacher’s license renewed — leading him to be evicted. In an email to his loan collector on August 30, 2016, Scott tried to explain that he’d again fallen behind on the payments after receiving notice from his landlord. Scott said his bank account was later garnished and he had to file for bankruptcy. It’s “obvious that the payment plans offered are sometimes unrealistic for someone to tackle on a teacher's salary,” said Louis Malfaro, president of Texas AFT. It's also counterproductive to deny a professional of the certification they need to work, he said. “It's clear that anything that encumbers someone from getting a job is a lousy way to try and collect debt payments from them." Scott now teaches classes for AVID, a college readiness program, and helps with a career and college preparatory program at the middle school. “I’m enjoying what I’m doing now, but no, I never got my position” as a department-chair back, he said. In Texas, falling behind on your student loan payments can cost you your license to work By Shannon Najmabadi March 20, 2018 When Roderick Scott Sr. submitted an application to renew his teacher’s license in the summer of 2015, he thought the matter was handled. 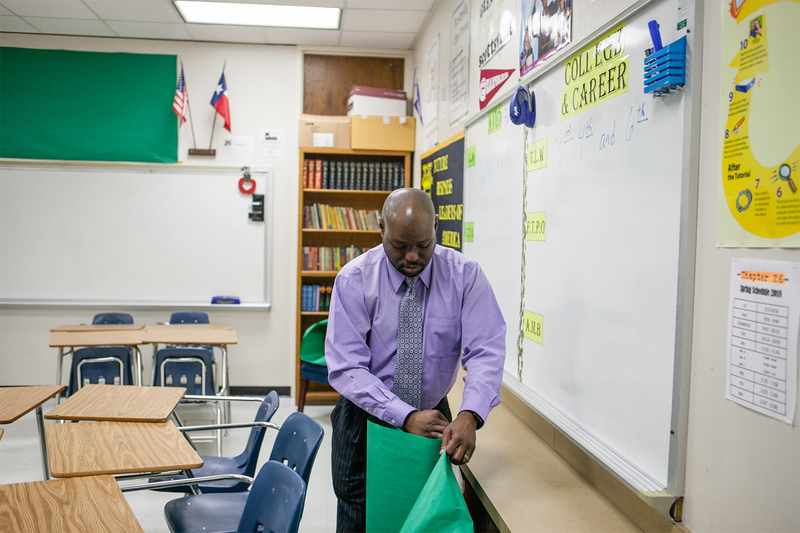 He had no idea that, months later, a decades-old Texas law would nearly derail his career as a middle school teacher in north Dallas because he’d defaulted on his student loans. Over the course of three years, Scott said he swiftly lost a “dream job,” was evicted, had his bank account garnished and eventually filed for bankruptcy. He's not the only one who's suffered such dramatic repercussions. Texas is among several states that bars teachers, dentists, nurses and other professional license holders from renewing their licenses if they are in default on their student loans. The ban was designed to push people to pay off their debt — or face the consequences. But even in Texas, a state that holds more than $70 billion of the country’s $1.3 trillion in outstanding student loans, critics call the practice counterproductive since it can impede people's ability to work and make it even harder for them to pay back their debt. There is no comprehensive source of data on how frequently this happens in Texas. Records from multiple organizations and agencies suggest more than 4,215 people in the state – including security guards, cosmetologists and pharmacists – were at risk of losing their license because of student loan default in 2017. Since 2010, 530 nurses were unable to renew their licenses because they were in default on their student loans, according to information provided to The Texas Tribune through a public information request. And nearly 250 teachers, like Scott, had an application for a license renewal denied for this reason over the course of five years, data from the Texas Education Agency shows. For Scott, 43, the first sign of trouble came one day in the fall of 2015. The school’s head of human resources called Scott into an office and asked why he hadn’t renewed his teacher’s license – a certification most Texas educators must have. Scott said he was confused. He’d submitted an online application and paid the fee to renew his license weeks ago. It took one frantic phone call to discover there was a major problem. Scott's renewal hadn’t been processed because he had fallen behind on his loan payments, and he quickly realized he was about to lose his best chance of getting back on track: his job as a teacher. “You do understand that, basically, I have been fired because you won't allow [the Texas Education Agency] to renew my certification,” he remembers telling his loan collector on the phone that day. Now, “you’re going to ‘fix things’ so that I can’t pay anything?” “I was like, ‘Oh my, you’re crazy,’” Scott said. 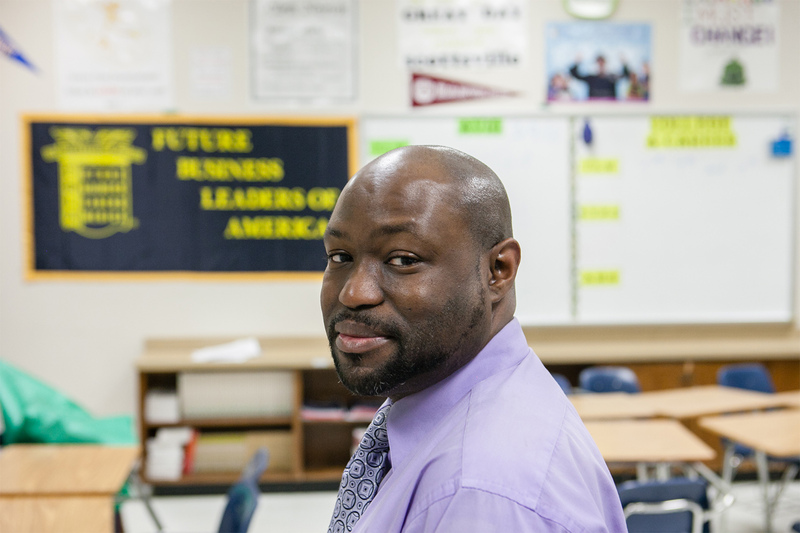 Roderick Scott, in his Dallas classroom on March 12, 2018. Leslie Boorhem-Stephenson for The Texas Tribune A tool that "wouldn't really address the problem" Texas is one of 19 states that will hold or revoke the work licenses of teachers and other professionals if the person is in default on their student loans, according to The New York Times. The practice in Texas dates back to 1989, when the Legislature passed a bill making loan default grounds for not renewing a license. At the time, Texas was experiencing historically high rates of student loan default, much of it coming from a burgeoning sector of lightly-regulated for-profit schools. Suspending professional licenses, state staff said then, could create “a powerful incentive for a person to stay current on his payments.” Already, lenders and loan guarantors had an array of financial hammers they could use to jolt borrowers into repayment. Tom Melecki, a long-time financial aid officer, said the rationale for the law might have been that it could be another “effective tool at kind of bludgeoning [borrowers] back into repayment.” Members of the state commission that helped pass the law are deceased, could not be reached or did not remember details about its passage. But a legislative liaison who met with government staff about the law said he recalls thinking that it "wouldn’t really address the problem” of defaults in the for-profit sector. “It may be helpful, but the defaults you see out there are largely among those who went to private trade schools and who probably didn’t get certified in what they went to school to be,” said George Torres, then the governmental relations director for the Texas Guaranteed Student Loan Corporation, a public nonprofit that's since been privatized and renamed Trellis Company. Suspending licenses penalized a different group of students, he said – those who’d graduated, gotten a certification, and had a lower risk of not paying back their loans. Still, Torres said, it was a tool proposed by legislative staff — one that could be fine-tuned later, if needed. "The money is needed around the house" The threat of losing his license — and therefore his job — pushed Scott, the Dallas middle school teacher, to take drastic action. He immediately paid the loan collector — borrowing money to do so — and entered into a repayment plan that let him keep his license. But during the time it took him to sort out the paperwork, his students were moved to a different teacher and he lost a department-chair position that came with an added stipend – making it even harder to make the loan payments, he said. Scott then made a string of financial sacrifices to afford the more than $300-a-month payment his loan collector asked for. He put the loan payment before rent and other bills. He was evicted, stayed with his brother and considered setting up a GoFundMe page to help ends meet. He tried to hide the trouble from his students, and from his 11-year-old and 3-year-old kids. “I just did not have that discretionary amount available,” Scott said. “If I was single, it probably wouldn’t have mattered. But, you know, being married and having children, it’s a different story. The money is needed around the house.” Teachers like Roderick Scott make up one of the largest groups of professionals in Texas at risk of losing their license because of student loan default, according to data maintained by Trellis. Leslie Boorhem-Stephenson for The Texas Tribune Scott’s loans were issued by the Texas Higher Education Coordinating Board, which a division in Attorney General Ken Paxton's office is responsible for collecting on. Trellis, the privatized descendant of the Texas Guaranteed Student Loan Corporation, plays a similar role for a handful of federal loans. A spokesperson for Paxton’s office said they don’t draft policy and so couldn’t comment on how effective not renewing a license is at getting borrowers back on track with their loans. Trellis has never tried to check. But Jeff Webster, the director of research at Trellis, said the company only uses the license provision as a last resort. Trellis, which also provides financial and loan counseling, will first offer eligible borrowers options like a deferment or to switch to an income-driven plan — a repayment option for federal loans that lets a low-earning borrower make smaller payments over a longer period of time, Webster said. “By the time it comes to having people have their professional licenses renewed, there's been a lot of interaction and conversation and attempts to talk with the borrower before you get to that point. And it really is kind of a last resort to try to engage the borrower to be able to — I know they've defaulted — but to get them into a repayment plan that can get their financial house in order,” Webster said. “One can do that with pretty reasonable and affordable payments, and sometimes that is really seen as a lifesaver for some of these borrowers.” Scott, whose loans are not with Trellis, says he wasn’t given this option. “It's clear that anything that encumbers someone from getting a job is a lousy way to try and collect debt payments from them.” — Louis Malfaro, president of the Texas American Federation of Teachers Effective at getting a borrower's attention Professional organizations contacted by the Tribune, including the Texas affiliate of the American Federation of Teachers, said they hadn’t heard of this situation befalling their members and thought it did not happen frequently. This may be because the 1989 legislators’ hypothesis was correct: Holding a professional license hostage is an effective way of getting a borrower’s attention. Data from the Texas Education Agency suggests that, like Scott, many educators whose licenses are denied for student loan default make payments and are able to have their renewal processed soon after. Critics of the practice, however, say it can also tee up an entirely new set of financial challenges for the borrower. “When teachers and nurses in Texas receive letters saying they'll lose their professional license unless they make a payment they can’t afford, too many of them wind up doing whatever it takes to stave off financial ruin,” said Randi Weingarten, president of the American Federation of Teachers. “It doesn’t actually get the loans paid off any faster, it just drives them deeper in the hole." Scott, for example, said he stopped paying rent in order to have his teacher’s license renewed — leading him to be evicted. In an email to his loan collector on August 30, 2016, Scott tried to explain that he’d again fallen behind on the payments after receiving notice from his landlord. “When we initially set up the payments,” Scott wrote, “you pointed out to me that you noticed I did not have enough funds to cover my living expenses and make such a payment. With current stress levels, I need time to gather myself and formulate some type of plan so that I can re-enter a payment plan.” Scott said his bank account was later garnished and he had to file for bankruptcy. It’s “obvious that the payment plans offered are sometimes unrealistic for someone to tackle on a teacher's salary,” said Louis Malfaro, president of Texas AFT. It's also counterproductive to deny a professional of the certification they need to work, he said. “It's clear that anything that encumbers someone from getting a job is a lousy way to try and collect debt payments from them." Scott now teaches classes for AVID, a college readiness program, and helps with a career and college preparatory program at the middle school. “I’m enjoying what I’m doing now, but no, I never got my position” as a department-chair back, he said. Read related Tribune coverage As Student Debt Grows, Board Tries to Relieve Some Financial Pressure Sunset Report Faults Student Loan Program Higher Ed Officials Tout Student Loan Amendment "In Texas, falling behind on your student loan payments can cost you your license to work" was first published at by The Texas Tribune, a nonprofit, nonpartisan media organization that informs Texans — and engages with them — about public policy, politics, government and statewide issues. Link back to the original article, which is located at https://www.texastribune.org/2018/03/20/texas-defaulting-student-loans-can-lo/.